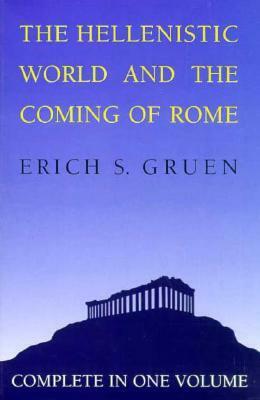 This is the second volume on the Hellenistic world and covers the encroachment of Rome over the Greek east from the Third Century B.C.E. up to 30 B.C.E. It was not a planned conquest but merely a slow improvisation over events to protect Roman power and respond to opportunities. Like the description of the British Empire coming about with a lack of foresight the same could be said of Roman Empires conquests in the eastern Mediterranean. It is was not a grand strategy that conquered the east but tactical improvisation. Like a grand strategy however the results were the same. This guy taught me Hellenistic history at Cal in the 80s. A great professor- a good writer. This is an awesome book. A favorite undergraduate text. Gruen is one of the most gifted lecturers I've ever had the pleasure of studying under, and one of the most engaging.